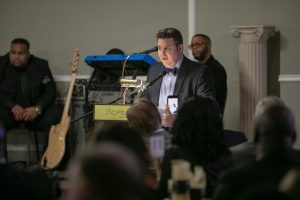 PENSACOLA: On Saturday, January 19, 2019, firm President Scott Remington was honored as one of the 2019 recipients of the “Living the Dream” award, an honor presented to local leaders who exemplify Dr. King’s dream of fairness, equality, and compassion. The award was presented at the 7th Annual Living the Dream Banquet and Tribute to Motown which benefits the Southern Youth Sports Association, a 501(c)3 organization that provides recreation, mentoring, education and support for inner city youth in the Pensacola area. Studer Properties was the presenting sponsor for the event. Remington has been practicing law for more than twenty years and has consistently been recognized for his legal work and his passion for the Pensacola community. He has been listed multiple times as a Florida Super Lawyer, Florida Trend’s Legal Elite, and holds an AV rating from Martindale Hubbell. Clark Partington is a regional full-service law firm with five offices in the Florida Panhandle and lower Alabama stretching from Orange Beach to Tallahassee. Scott Remington is resident in the Pensacola office of the firm. Sign up for our newsletter to keep up with Clark Partington announcements and updates. We are Clark Partington—a preeminent Gulf Coast regional law firm serving the comprehensive legal needs of individuals and businesses as lifelong trusted advisors and counsel. Clark Partington. Trust Elevated. © Clark Partington Hart Larry Bond & Stackhouse, P.A., 2019. All rights reserved.